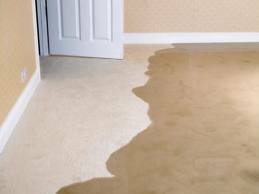 Things to DO when you have a water damage water damage or flood. Do remove as much excess water as possible by mopping and blotting. Only use newspapers as a last resort. Wipe as much excess water from wood furniture after removal of lamps and tables top items. Place aluminum foil, saucers or unstained wood blocks between furniture legs and wet carpeting. Wood stains may permanently stain carpet. Remove and prop up wet upholstery cushions for even drying. Check for possible bleeding fabric. Open windows slightly to dry quickly in the winter. Moisture must escape when drying. Turn on heater if possible Set up fans if there is no standing water near that fan. Remove wool or other colored rugs off wet wall to wall carpeting. Punch small holes in sagging ceilings to relieve trapped water. Do not remove any loose paint off ceiling. Do not use your household vacuum to remove water. Use only a wet vac only to start the process. Do not leave wet fabrics in place. Dry them as soon as possible. Hang furs and leather goods then dry separately at room temperature. Do not leave books, magazines or other colored items on wet carpet or floors. Newspaper print can stain carpet. Avoid if possible. Do not use your television or other appliances while standing on wet carpet or floors. Especially not on wet concrete floors. Do not remove carpet from tact board if you have wool carpet until the water has been removed. Shrinkage may occur. Do not make any cuts in your carpet or in seams. You may fray carpet.